This course provides exhaustive knowledge in the principles and practice of Diagnostic tests to comprehend reliability and validity of a new diagnostic test, the biases and the challenges in designing a study and, critically evaluate a diagnostic study article. This course will include lectures and comprise a series of practical. Correctly interpret diagnostic information (sensitivity, specificity, likelihood ratios, ROCs, accuracy) from different data sources. Combine diagnostic information from multiple tests, when tests are independent and not independent. Accurately interpret an ROC curve and identify best cutpoints. Recognize when verification bias (work-up bias) is a threat to study validity and calculate the magnitude of error from such bias. Assess magnitude and direction of error when the gold standard is imperfect. Generate likelihood ratios from logistic regression models, and understand relationship between odds ratios and likelihood ratios. Critique and revise published articles on diagnostic tests; optimize presentation of results. This course is tailored to medical, allied health professionals, nonmedical faculty, and/or researchers actively involved in diagnostic test research (validity and reliability studies), or teaching institution or in furthering their knowledge and skills in methodology. Each participant will be randomly allocated to a group and the group will be assigned a research question and given background materials to develop a protocol following STARD guidelines. Each group’s protocol development process will be facilitated by a mentor. Each group will be asked to present their protocol orally to the rest of the groups and faculty for discussion. The participants will be Journal articles critique with the help of mentor. Course Fee should be paid in full by September 14, 2016. Payment can be made by Demand Draft (DD) in favour of “Christian Medical College Vellore Association Account “, payable at Vellore. 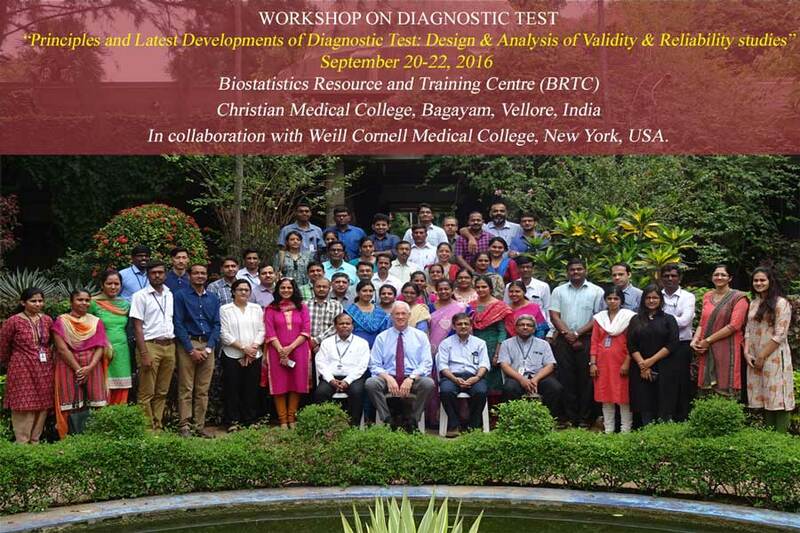 Dx test software Developed and validated with STATA and MedCalc software by Biostatistics Resource and Training Centre (BRTC) team, will be provided free of cost for course participants. The number of participants: Limited to 45 admissions & this will be purely on first come first served basis. 14.00 - 15.30 why are sensitivity and specificity bad concepts and Why is the area under the ROC curve a bad measure of test performance? 09.00 - 10.30 What's the relationship between LRs and ROCs? How do you know how many LRs a test should have? 10.45 - 13.00 How do you calculate the 95% CI for a LR? What's the optimal cutpoint on an ROC? 14.00 - 15.30 What's the relationship between LRs and ORs? How do you correctly interpret diagnostic information from a paper describing a diagnostic test when they present it incorrectly? 09.00 - 10.30 How do you calculate LRs from logistic regression models? What are disadvantages of a typical meta-analysis of a diagnostic test reporting a summary ROC?